The Liz Lisa 2015 Fukubukuros were announced today! I logged in pretty much straight away when they were released to quickly put an order in! haha. For those of you who don't know what a Fukubukuro is, it is a "lucky pack" that they sell on New Year's day in Japan. A "lucky pack" usually has a whole bunch of items inside the bag that is usually worth more than the price you're paying. Heaps of people line up for the Fukubukuros every year! Heaps of stores in Japan do Fukubukuros (Almost all the Shibuya109 brands, Apple Store, variety stores etc). Anyway! I'm not sure when I will be back in Japan so I decided to just preorder a Fukubukuro myself! Here are the ones they released this year! 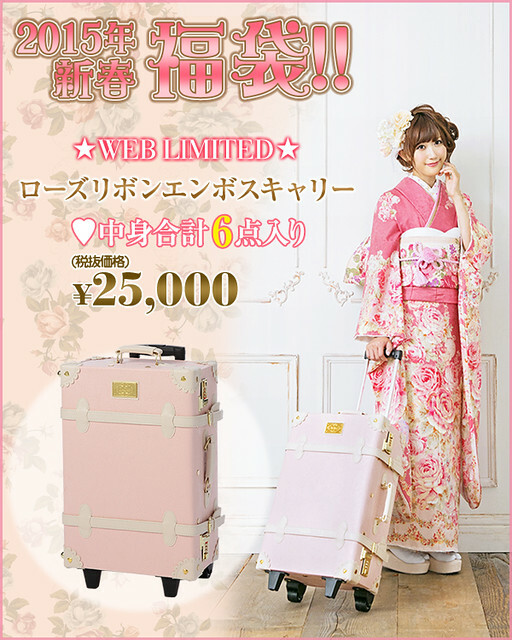 This is a web limited edition item. I was going to get this but decided not to, mainly because well... 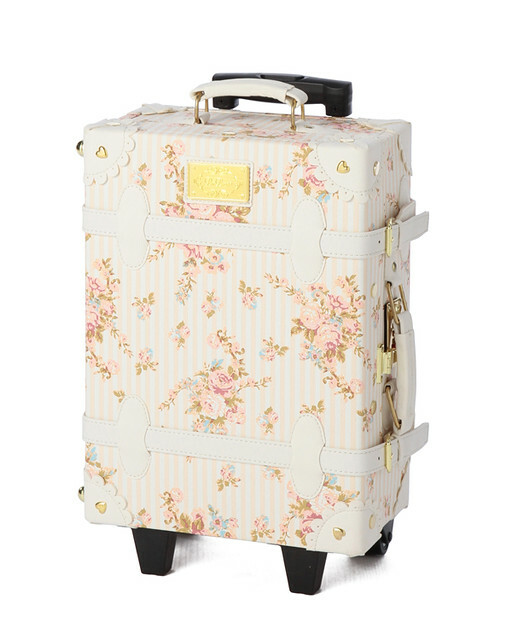 I don't need more suitcases and shipping will be expensive :( Also, I think it will be quite similar to the one I already have. 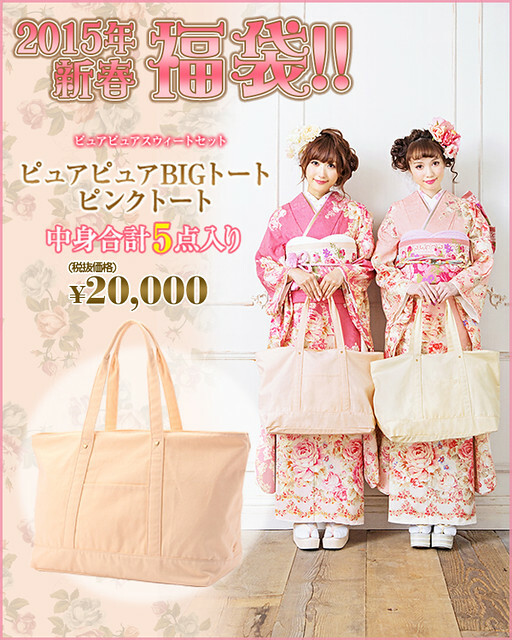 The price is ¥27,000 including tax for the item which is quite expensive. It will have 6 items that come in it I believe. This one I was kind of surprised at because it's really... plain. 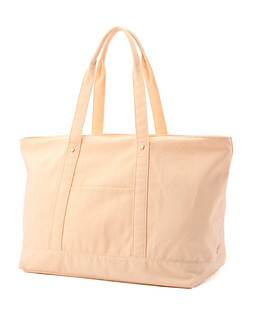 It comes in 2 colours, a white and a pink and it is ¥21,600 including tax for one of them. Pretty expensive so I was a bit disappointed in this one. It says there are 5 items in a bag and you can do 2 different coordinates with them. 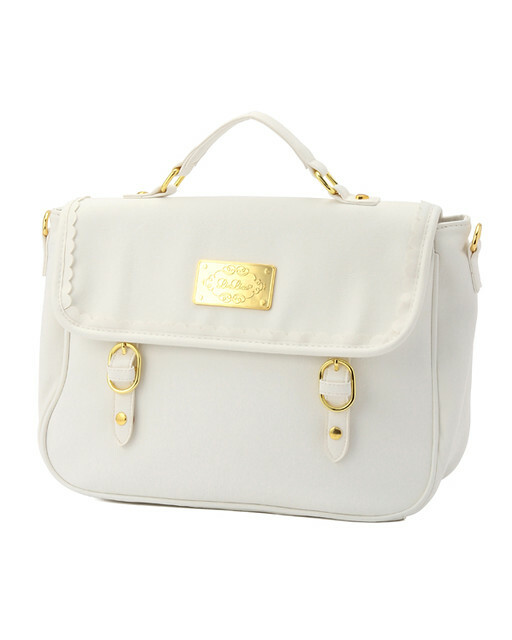 This is the one I bought because it's SO FREAKING ADORABLE!!! Yeah, I know I said I didn't need another suitcase but this is a mini one (I might be able to find some use... haha). This one is ¥16,200 with the tax included. It will have coat inside it and 3 other items. I'm a sucker for vintage rose patterns so I was sold the second I saw it haha. I ordered this straight away before the site crash so *phew*! 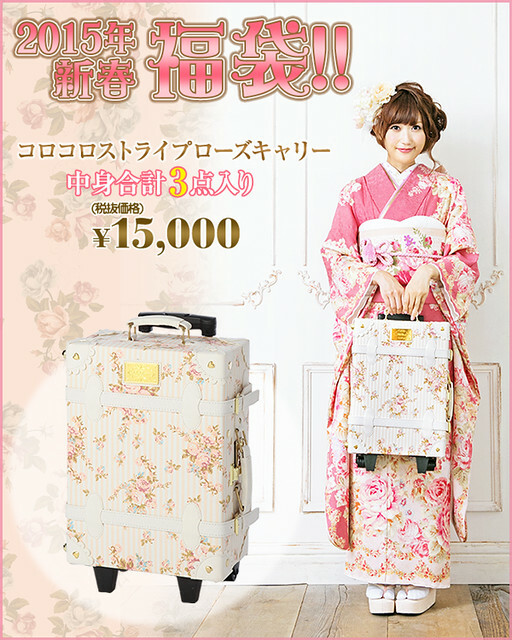 There is an option where you can get both the Koro Koro suitcase and the More More bag together. I originally was going to get this because I thought it was cheaper, but nope it's the same price lol. Including tax it is ¥21,600. Luckily I thought about it before I checked out :P I didn't really want the other bag so I just got the Koro Koro Stripe Rose Carry by itself. So what do you guys think about the Fukubukuros? Are you going to order one as well? Let me know! 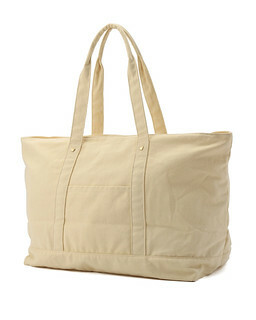 Actually I think the set is more confusing because of the # of items in the 3-way bag (2 or 3? ), not the mini trunk? 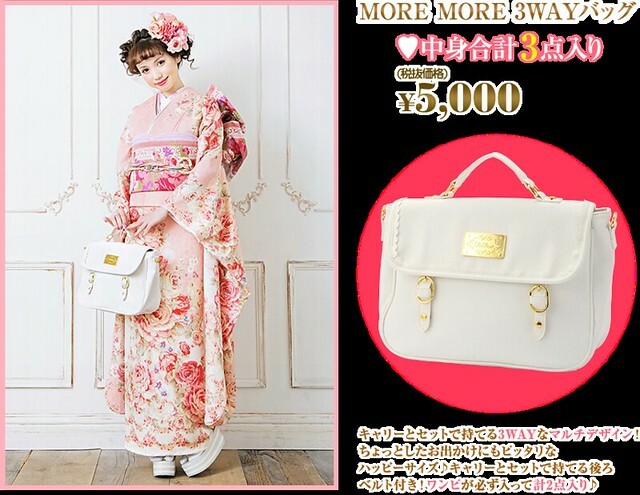 I've seen the most conflicting info about the content items in the 5000yen 3-way bag compared to the # in the mini trunk (which I consistently saw as 3 items including a coat until this post here)? Idk. How can you preorder the bags? Pleeeeeeease ~ tell me where you pre-ordered yours ! please tell meee!! > < ! 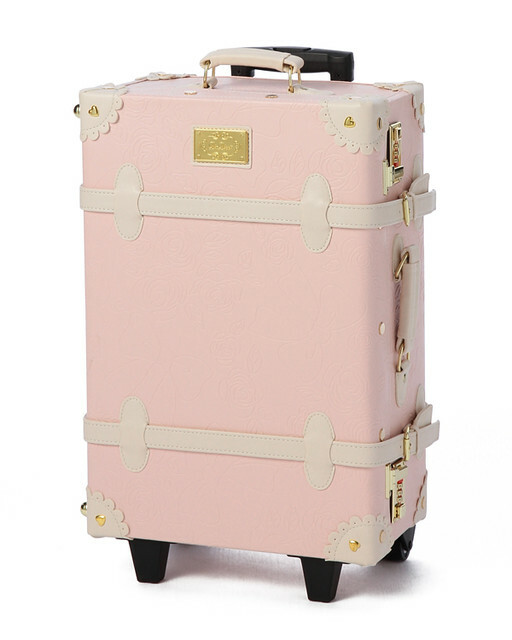 The suit cases are so cute! Hope Kim doesn't mind me answering this since I'm sure she is busy. (+ I keep getting Disqus emails from this post :|) You can preorder them directly from Tokyo Kawaii Life (Liz Lisa's online shop) [http://www.tokyokawaiilife.jp/shop/liz-lisa/item/list/category_id/1]. I made a short tutorial for how to order from there if it's your first time in one of my blog posts. I would be happy to help you if you need assistance. If you don't live in Japan, you'll need a forwarding service like Tenso to be an intermediary. 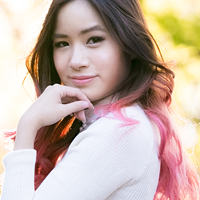 I'd love to help if you need it! Is it just me or are these bags becoming more expensive? I recently placed my xmas order, and I imagine it will be shipped out by tomorrow. Tenso's fees have gone down, and with the yen weak to the dollar, I did a little better than I thought I would this season. hehe that's fine! sorry I don't really have much time to check my comments (damn full time work) so I appreciate you helping people out!! Hmm I'm not sure now :S I was super confused with how they were explaining things. Maybe we will find out next week if they decide to tell us what's in the bags? Is there anyway to order them without knowing Japanese? Do they do international shipping? Liz Lisa 2015 Fukubukuro Reveal!